In many of my ceremonies, especially a more elaborate and larger/formal ceremony like Alec and Ashley’s a few weeks ago at Seattle’s Design Center, I do move around. In the photo to the right, I opened the ceremony by speaking from several vantage points, giving Alec and Ashley an opportunity to face their guests for the first one-third or so of their wedding ceremony. In this Celebrant/Officiant work that I do, facing forward for part of a ceremony is a personal choice. I venture to say that a third of my couples select this option. 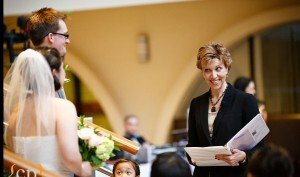 If I do officiate a ceremony from a more traditional position (couple facing each other) with me in the middle, I do move to the right and left during a ceremony. This way, a photographer can get clean shots of a couple without having me always in the photo (get outta the photo, Annemarie!) and this also gives a couple a bit of intimacy during their ceremony.